When you feel like a pie! 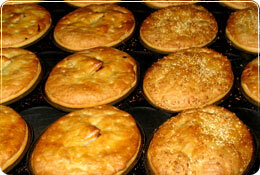 Rolf’s Pies is an award-winning retail pie shop operating at 181 Middleborough Road, Box Hill South in Victoria. At Rolf’s Pies, we use only top-quality ingredients and are proud of our innovative range of “home-made” style products which include delicious savoury pies, pasties, quiches and rolls as well as fruit pies, cakes, muffins and tarts. Rolf's Pies consistently enjoy great success at the Official Great Aussie Meat Pie Competition - many of the pies we feature as "Pie of the Week" have won medals at this event. Our gold-medal winning Canadian Maple Steak Pie was voted the best in Victoria! In fact, this delicious steak pie (coarse mince steak marinated in maple syrup, then simmered with caramelised onions & fresh basil) came tied runner-up in the Australia-wide competition, from a field of more than 180 pie-makers! Our Kalahari Spicy Bushmans Pie has also been awarded a gold medal, whilst our Bombay Lamb, Chicken Funghi & Leek and Tom Yum Hot & Spicy Seafood Pies have brought home silver medals. You can view our full range of Lunch, Dinner, Party and Sweet Tooth menu's on the site as well as prices. Or having a party with Rolf's Pies might be just what you need.